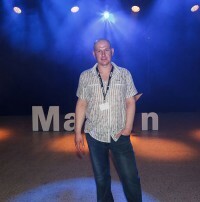 On the last day of Prolight & Sound NAMM Russia in Moscow, Artem Sagaidak from Naberezhnye, Chelny was awarded a Harman Martin M2GO lighting console as winner of Martin’s second annual Russian Lighting Designer Contest. Contestants had at their disposal Martin MAC 101, MAC Aura and MAC Viper Profile moving heads, as well as Atomic 3000 strobes with an M1 lighting console for control. Contest rules were the same for all participants: one rig, one music track and unlimited latitude for creativity. A panel consisting of Martin executives and Russia-based Martin personnel judged the light shows.